Chess is one of the world's oldest and most finely crafted games. Its strategies and complexities have fascinated players for decades (centuries, even), and at a professional level commands extraordinary dedication and expertise. For the majority of us it's an engaging game that is nevertheless quite casual, as we leave 'Grandmaster' strategies to the finest of minds. Its grand old allure suits gaming systems rather well. Yes, you can play chess for free in web browsers and mobile apps, but a bit of prestige around the experience can also be rather appealing. 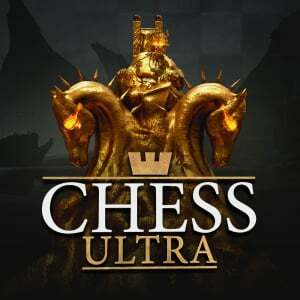 Pure Chess (developed by VooFoo Studios but published by Ripstone) tapped into that on Wii U and 3DS, and now Ripstone has released Chess Ultra on Switch, developed by its own team and seemingly aiming to right the relatively few wrongs of its Pure predecessor. At its core the idea is the same - matches are presented across beautifully rendered and stylish settings, four of them in this case, with variations in piece styles and material also available. From a grand manor house to trendy public spaces and the rather eerie 'Gomorrah' setting, you have pleasing options to add visual pizzazz to your game. You can choose between camera angles and even move it to a limited degree with the right analogue stick, while there's a lovely soundtrack to add to the ambience. It's an attractive and classy way to play chess either on the TV or portable screen. It's a familiar approach, then, so what matters - and justifies spending money on a game like this - is the feature set. Chess is a complex game, and this title makes a decent effort at embracing that while giving players the flexibility to enjoy it in their own way. For beginners we have Tutorials, which go through the most elementary of basics - such as how each piece moves - to a few more complex openings and scenarios. It's a decent set of lessons for those new to chess, though anyone quite familiar and experienced in the game will likely skip through most of this section. The lessons are concise and require active participation, however, so they are indeed ideal for those keen to get into chess but unsure of how to start. Skilled players have the Challenges to consider, of which there are 80 in total. 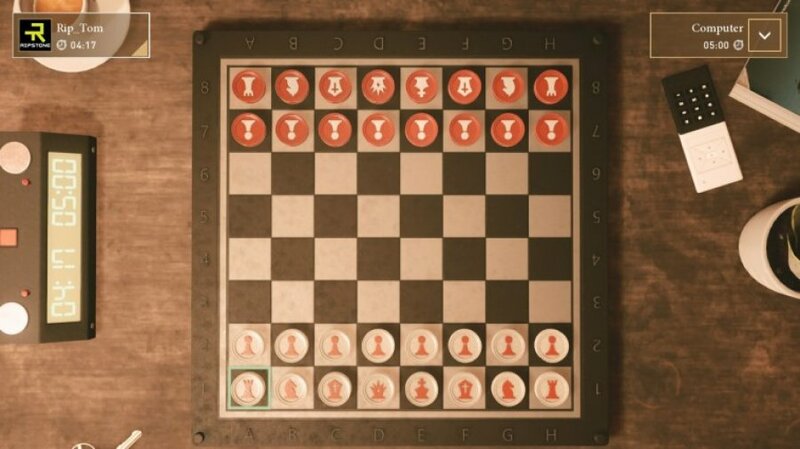 There are sets of 'checkmate' challenges, ranging from 1 move up to 7, in which you need to figure out how to win in each scenario. Particularly fascinating and indeed challenging are Historic alternatives; these give history lessons on legendary matches and then task you with recreating their closing moves. These are definitely there for those ready to really push themselves, as you're essentially trying to mimic the strategies of some of the game's greatest ever players. 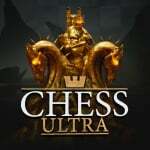 What matters, of course, is the flexibility on offer for online and offline games, which is where Chess Ultra delivers well, most of the time. Playing offline offers similar opportunities to the aforementioned Pure Chess from Wii U / 3DS - you can play on the TV or with the Switch flat on the table in portable mode. Strangely, playing on the TV won't allow one player to use a Pro Controller and another use two Joy-Con in a grip, for example - you pass a controller back and forth if you opt for a dual stick option. It's a silly oversight, albeit not exactly a deal breaker. The game is also fussy in terms of how you play locally in the portable mode. It makes clear that you should detach the Joy-Con and take one each, and sticks to its guns. The effect is decent, in any case - with the screen flat on a table you position yourselves as you would with a real board, and when the turn changes hands it flips the UI to face the moving player. It's a simple effect, but a nice one. Playing solo you can naturally use any controller you want, and if playing the computer AI you can take on one of ten difficulty levels, from 'Novice' to 'Grandmaster', another feature pretty much lifted from Pure Chess. All of the customisation options can be applied in AI games, and these matches also count towards your Elo rating. This rating is applied across your profile; when you fire up the game you log in with one of the Switch console's users, and this is automatically your ID and account in the game. It's a smart implementation of the system-level setup to get you straight into the action. The Elo rating you earn is most relevant, naturally, once you take the game online. Although this title shares a flaw or two with Pure Chess, it serves up a much improved online experience. It offers cross-platform play like its spiritual successor, boosting your odds of finding opponents, but adds one key thing - real-time games. You can still have matches with no time limits or 24 hours per move, but you can also play a live match. Options include a Blitz timer (5 minutes each), the Fischer timer (30 minutes each with an extra 30 seconds for each move) or the Standard timer typically employed in real world tournaments (45 minutes each). You can choose your settings and then search for opponents, with the game trying to match players with similar ratings. There can be a bit of a wait and in one session we were consistently matched with the same high ranking player, but it's also possible to be patient and get an even game. The player base needs to grow, no doubt about it, but when you find a well-matched opponent you can have an enjoyable real-time game of chess. In addition you can set your rules and invite players from your friend list or those you played recently; you can see who's online but there's no in-app communication, nevertheless you can send the request and see if they join in. When sending speculative invites 24 hours per move is likely the best choice, but if you have online buddies that you chat with in forums / Discord etc you can easily agree a time and get into a game. Overall you can, with a bit of patience or organisation, enjoy online chess games at whatever tempo suits you, a clear upgrade over the equivalent options on Wii U and 3DS. On top of that Chess Ultra features Tournaments; you can take part in up to three at a time. You set your preferred play style and timer choice and the game immediately tries to match you up with another 31 players (or less, if you choose) for a bracket format; you can also invite friends and recent opponents, too. Jumping into a tournament with strict time clocks isn't ideal against random players, as initiating the game is hit or miss. As you can have Tournaments of as little as four players, however, it wouldn't be too difficult to arrange a competition with some friends for that extra edge. When playing with random opponents in a Tournament the 72 hour moves are almost certainly the way to go for a slower but reliable contest. All told what we have with Chess Ultra is a polished and well constructed title. It falls short of true excellence due to controller quirks in local multiplayer and a few missing conveniences in online play, such as a notification system or means by which to communicate more directly. Nevertheless it offers plenty of play options in addition to tutorials and challenges to flesh out the experience. As an extra note, too, you can work your way around and play using nothing but the touchscreen, meaning you can just about play it on the Switch as if it were a tablet. Flexibility like that adds to this one's appeal. Chess Ultra is a welcome arrival on the Nintendo Switch; it's a visual treat, while also soothing you with pleasant music as you engage in a tough match. There are plenty of options and variety for online and offline matches, with the former being particularly enjoyable if you're able to get into a real-time contest. With Tournament play and some well constructed Challenges on board, along with Tutorials for newcomers, it ticks most boxes. It's another checkmate for the Switch eShop. This looks like a Chess game to be proud of. I’m tempted by this - Chess is a game I’ve always wanted to get into but I’ve haven’t made the effort to learn how to play. I can see this having limited appeal, but welcome for those who want chess on a Switch. 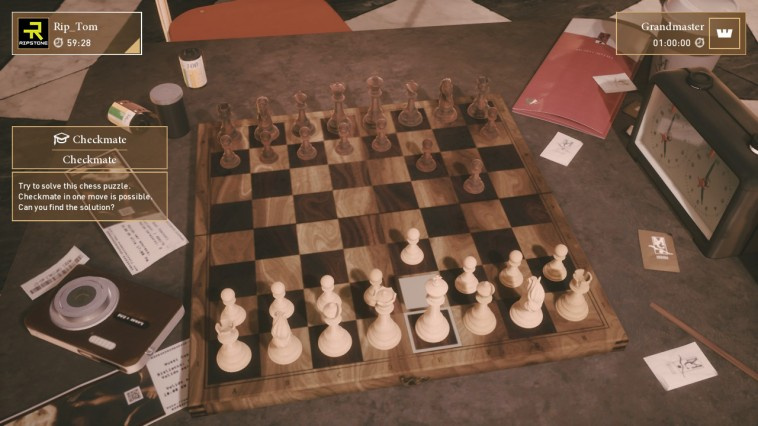 If you are into chess playing on a real board with real plastic or wood pieces would be more fun. Out and about and there are dozens of free chess games for smartphones and tablets. 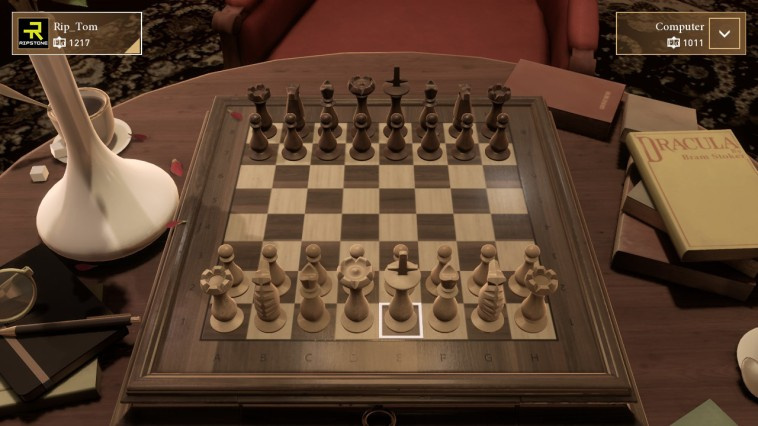 Looks basically the same as Pure Chess on Wii U. This game is awesome. Best chess game I've played. Great review! Great review, @ThomasBW84! 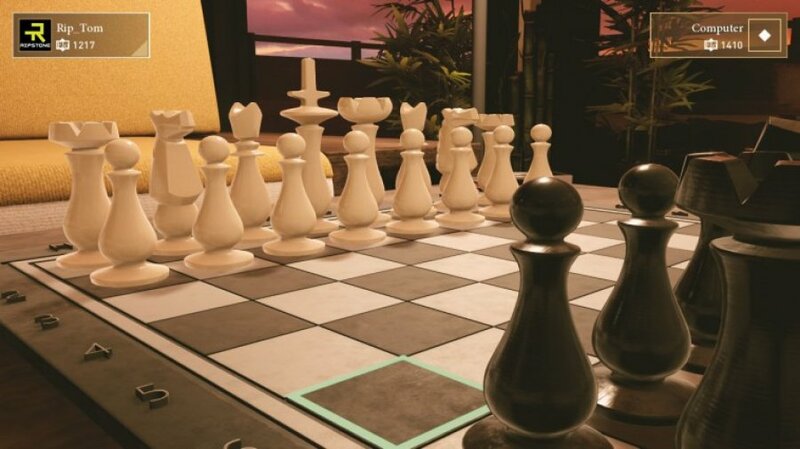 Pure Chess was great on the Wii U and other consoles, and Chess Ultra is great on the Switch. Limited appeal, but chess fans are in for a real treat when a game like this doesn't turn out to be pure throwaway shovelware but handled with care. I find the package very pleasing and relaxing to play. "a notification system or means by which to communicate more directly." I don't see this like a game's fault but Nintendo's. It's always the same, 12 years ago we had cross chat, notifications, simple text messages on the Xbox 360, today we have nothing on the Switch. It's even a step back from WiiU days, which says it all. Is anyone else getting Harry Potter vibes from that image with the statue-like pieces? I might pick this up when I have a Switch of my own. @MonkiPlays That’s not at all how reviews work. Definitely some nice upgrades over the Wii U version, worth the double dip. I heard that this has cross-play with other platforms. Someone correct me if I'm wrong. @Shiryu They don't make boxart that cool anymore. @Azooooz I'm pretty sure they confirmed cross-platform play. Hmm... I love chess, but I'm not sure I want to spend ten bucks on something I already have for free on my mobile, with an already large user base. But if it gets more people playing chess, that's a good thing. I think I might get this. Hadn't realised you could have online matches that don't need to be played live. 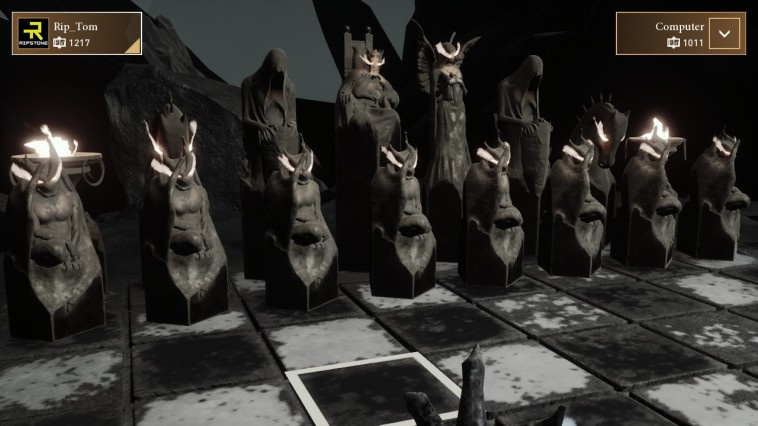 @MonkiPlays A game should be judged on its own merits and the value for money it offers. This is arguably the finest game of Chess you can play right now, so at £9.99, deserves its high score. Frankly, I fail to see what's so amusing. I might actually buy it. I've loved chess since I was a child and the online options sound appealing. @ThomasBW84 So can you not move pieces with the touch screen in portable mode? Is there a way to play local multiplayer in docked mode using two Joy Cons? We're trying it here and it only seems to work in portable mode — switching to the TV changes the controller scheme so that the two Joy Cons no longer work for 2P play, they control one player at a time and the user must give both Joy Cons to the other player to play together. Can it use Touch screen to move the Rook / Queen / etc ? @Megal0maniac Ouch! Hopefully they'll add support for dual Joy Con/Pro Controller play in a future patch! @Majora1 Yeah, surely that mustn't be too much trouble for them. I wonder if Ludeme Games will port Chess 2 to the Switch? By the way, a couple of comments are thinking this is the same game as 'Pure Chess' on the Wii U / 3DS. It is completely different, albeit it shares a few ideas. @ThomasBW84 Looks like I should have read the review more closely! Thanks for clearing that up. I haven't had time to break out my chess set because of my job. So this is the next best thing if I want to play when Im home. I will definitely check this out! How are the graphics? It prides itself on being a beautiful game, but these pictures in the article look super blurry. The trailer for the Switch game looks OK, but nowhere as nice as on other consoles. I like chess, but I can't play properly to save myself. I appreciate the tutorial section! @alasdair91 It's prettier than those screens suggest, the assets weren't particularly high-res. It's quite good looking overall, occasional flickers but, on the whole, it's an attractive game. Ya... screw it... 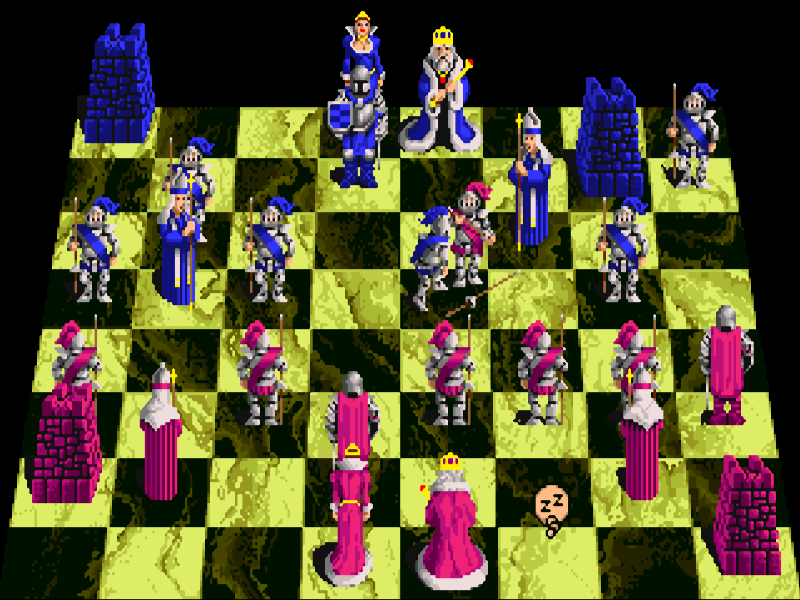 I'ma want a good chess game for the ol' Switcheroo Collection. I think it's worth noting that this game occupies over 2GB of space!! That is absolutely ridiculous for a game as simple as chess. @SLIGEACH_EIRE looks aside, I wonder how the gameplay compares? Was the Wii U game decent? For me, I like the idea of playing this on the sofa and then playing a bit at the coffee shop. For ten bucks, I’d definitely consider it. @KIRO Yes the game plays well and it's more than decent. Chess game on Switch, 3DS, consoles, pc, mobile, etc they are all the same: they can easily beat the average player. To make the AI play like your human friends you need to handicap it by lowering it's processing time. This to me is the problem with chess, even the best player in the world can't beat the AI anymore. If you want to make a chess game, make it an entertaining one. How about having the AI taunting you with every move you make. Or having a commentator like a sports game describing your move/strategy? @slider271 OMG I had that game and would use that mode because it made considerably better moves with the 8hrs,. It did pretty well for it's pea brain 8bit 1mhz (yes) CPU. Your Moms name isn't Dawn is it......lol. @SLIGEACH_EIRE It doesn't look at all like the Wii U game. Clean that dust from your screen. Like chess and glad they've done a decent version here. Wish one game would include an "exchange chess" option. Used to love playing that at school. The game is very nice. I like that you can lock the camera with clicking the right stick and then still can zoom to your preffered level. The chess pieces I find a bit fuzzy looking, especially the oponent ones because there even smaller. I find this the worst when using the Staunton chess pieces in the Musei Capatali. 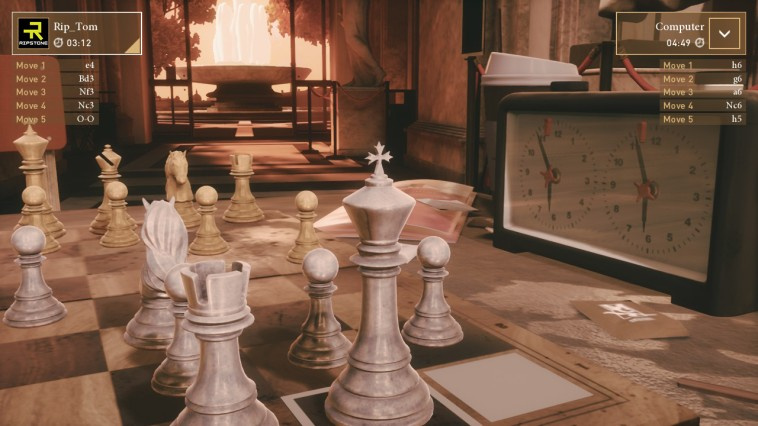 I can't really put my finger on it but it's like the lighting in the game makes me want to rub my eyes in an effort to see the chess pieces sharper. I also noticed the few games I played the computer likes to follow the same opening moves. If I start the same way as in a previous game the computer plays the exact same moves. Again, I only played a few games so maybe I'm too fast to judge here. I also noticed that the game likes to eat my battery a lot. These things asside I really like the game and the music and sound effects are spot on. In Woodburn Manor you hear the wind outside and the crackling fire with great music next to it. Turn the music volume down and you're having a relaxing game on a cold stormy night! 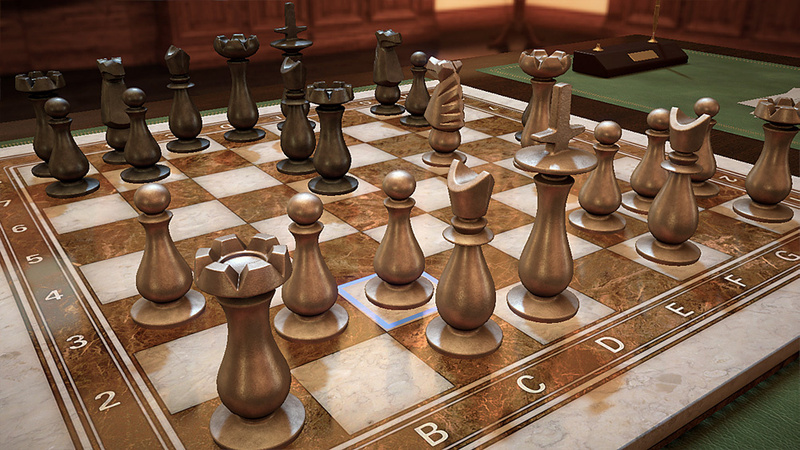 It looks every bit as good as Chess Ultra. Haven't played chess in ages, maybe I'll get this at some point. No doubt I'll get beaten if I play online. Tiny Barbarian reversible box art was pretty cool. Will def download this. My friend just learned how to play chess and this will be fun 2player on the Switch! looks beautiful, chess (and go) is the king of games. By the way, that tagline is absolutely terrible. Just let the puns come naturally rather than (badly) trying to force them in there. i've seriously spent 20,000 hours on this one. now the cool innovation i would like to see is a computer that makes the same types of mistakes made by humans and that would get in time trouble on purpose in the same sorts of positions. @KIRO I play chess fairly competitively. Pure Chess's primary selling point is in.graphics and visual options. Being able to play with fancy sets that would cost a lot in real time has a lot of appeal. The AI is pretty good but suffers from limited variety - you can replay the same match by replicating the same moves. I hope the ai is improved for this release so I can enjoy it more. The puzzles for Pure Chess were pretty basic even at the highest difficulties but do.serve to help teach chess concepts to beginners. Even Battle Chess could have a new entry sometimes. @Tetsuro I really loved those animation and sounds when the pieces clashed Actually, I played it a lot before I had a real soundcard so it was mostly aggressive beeps, but refined beeps none the less. 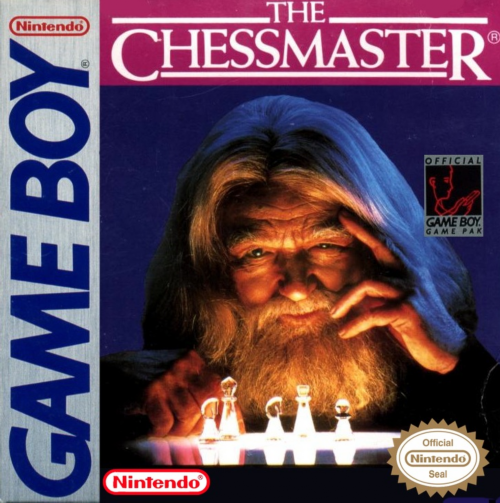 For me, nothing will ever beat Majestic Chess for the PC in terms of pure fun. It took chess and turned it into a fantasy adventure that would teach you everything from the basics to advanced strategy. You could also just play straight chess either online or against the AI. And the set pieces and play environments were really good looking for its time. Awesome game. @sillygostly "I think it's worth noting that this game occupies over 2GB of space!! That is absolutely ridiculous for a game as simple as chess." Oh dear. No doubt you considered the Deep Blue computer that defeated Kasparov overpowered too. @sillygostly Almost all that space is for visual assets. 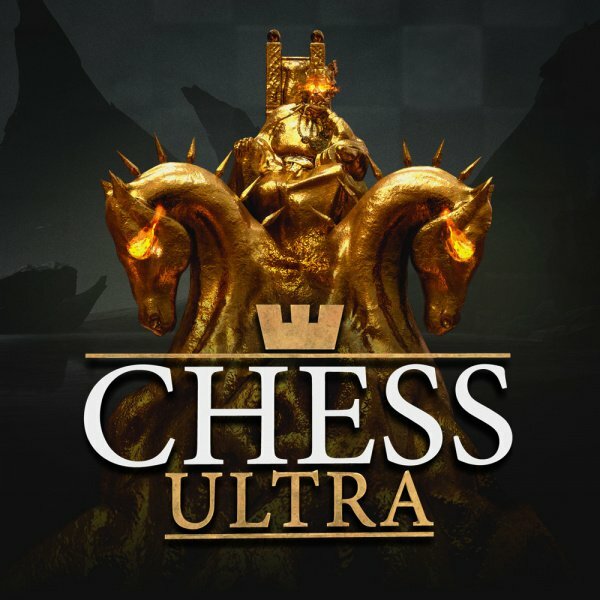 Ultra Chess's primary selling point. @feelinsupersonic Think I've seen developments in chess programme AI that would simulate that. Seriously doubt that would be used in a game like this though - Could be wrong. The main issue with this game is that it constantly tries to connect to the internet, giving you "cant connect" notifications constantly when trying to play on the go. @Jansen You triggered the profanity filter, please don't. It is a great game and the lack of any sort of messaging is frustrating. I played lots in the first couple of weeks, then lost a couple by making stupid mistakes and got annoyed, then got distracted by other games. Started a new marathon yesterday though.